What could be better than a beautiful, easy-to-make gift that the whole family can enjoy playing? In this project, you'll make four tangram puzzles and a matching box for storage. 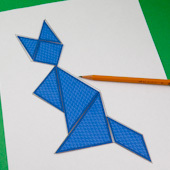 This project includes tips for games to play with the tangram puzzles. The tangram puzzle sets can be used individually or mixed together and offer possibilities for hours of fun! The tangram is a puzzle game that originated in China during the 1800s. It is very popular with both children and adults. Each tangram puzzle has seven pieces, also called tans, cut from one large square—two large triangles, one medium-sized triangle, two small triangles, one square, and one parallelogram. It is a puzzle that requires imagination and creativity. Related craft: See the Tangram Puzzles to Make craft project for instructions for making tangram puzzles, additional printable tangram patterns, puzzle sheets, a solution sheet, and rules for playing with the tangram puzzle. Related craft: See the Interlocking Curves Box craft project for box-making instructions, more box patterns, and ideas on how to decorate your storage box. Choose the tangram puzzle set that you want to make. Each pattern makes four 3.875" (98 mm) square tangram puzzles. Download and then print the tangram puzzle pattern on paper or cardstock. It is best to print the pattern on paper that is 24# (90 gsm) or heavier, and then adhere the pattern to cardboard. The Wood Grain tangrams look best when printed on photo paper. Choose a box to make. Download and print the pattern. The pattern includes both the top and bottom of the box, which are identical in size. Make a lightweight box by printing directly on cardstock. For a stronger box, print a black-and-white pattern on computer paper, and trace or transfer the pattern to cardboard before proceeding. You might also print a colored pattern on paper and adhere it to cardboard. The Lid Decorations pattern is for adding a tangram decoration to a solid color box lid, to the box's bottom or inside the box. Print it on paper. 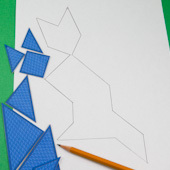 Of course, you can also use it to make several very small tangram puzzles. Do a rough cut of each tangram puzzle, leaving some white border space around the puzzle. Glue each puzzle to a piece of cardboard a little bigger than the puzzle. 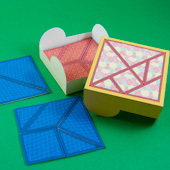 Mat board makes the most durable tangrams, but poster board and Bristol board also work well. Be sure that the glue completely covers the back of the tangram puzzle. Also make sure that there are no loose corners or sides. Tip: For puzzles printed on cardstock, make a sturdier puzzle by gluing the printed pattern to another piece of cardstock. Cut each tangram puzzle into seven pieces on the solid black lines. Try to make your cuts very straight. The tangram puzzle will work better and be more fun with straight edges. Mat board must be cut with a craft knife! It is also easier to make straight cuts with a craft knife and ruler. Protect your work surface with thick cardboard or a cutting mat. Place the ruler along the line to be cut, then carefully draw the craft knife along the ruler's edge. Be sure to keep your fingertips away from the knife. Kids require adult supervision when using a craft knife! 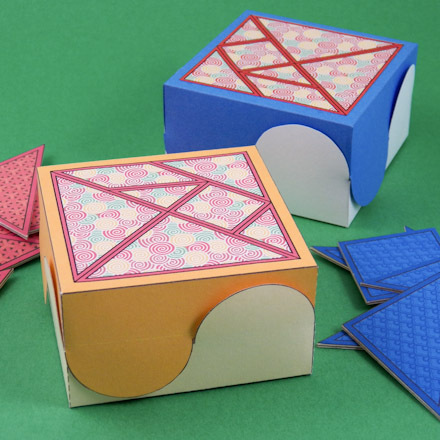 The box can be made of cardstock or cardboard. If you are making a cardboard box, print the Black & White pattern on paper and either trace or transfer the pattern to cardboard before proceeding. You might also print a colored pattern on paper and adhere to cardboard. with spray adhesive. Follow the instructions for making the box in the Interlocking Curves Box craft project. Put the bottom together by rotating the top one quarter-turn and then slipping the box halves together with all the curved sections on the outside. The top and bottom curves will lock together to form an s-shaped curve. Place all four tangram puzzles inside the box in layers. The puzzles will fit nicely in the box if each puzzle is arranged into two identically sized squares. Refer to the drawing below for making one square with the two large triangles and another square with the other five puzzle pieces (tans). That's it! Your tangram puzzle boxed set is complete! Tip: Play "shape challenge" with a friend. On a sheet of white paper, arrange your tangram pieces in a design of your own creation—a bird or a cat, for example. Use a pencil to trace around your design, creating an outline. Your friend should do the same thing. Now, trade your outlines and see if you can make each other's design. Tip: Play a game of "tangram match" with up to four players, each with their own tangram puzzle. Place a tangram silhouette in the center of the table; the first person to arrange the tangram pieces to match the shape wins the round and scores one point. Play as many rounds as you like. The winner is the person who has the most points at the end of the game. 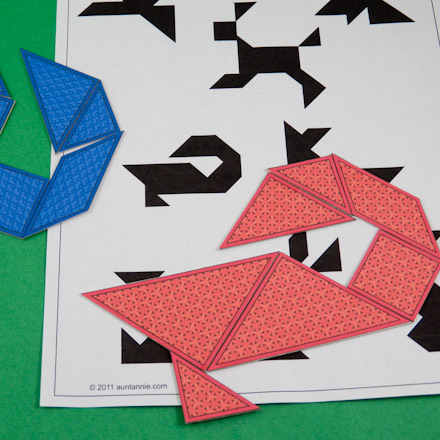 See the Tangram Puzzles to Make craft project for printable puzzle sheets. 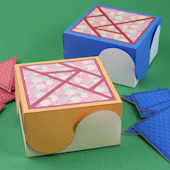 Tip: Pick the tangram decoration for your box from the five choices on the Lid Decorations pattern. 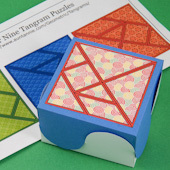 Tip: The tangram interlocking curves box will hold all four tangram puzzles. The puzzles fit nicely in the box if each puzzle is arranged into two identically sized squares. Tip: Print this game information sheet to include inside the box with the tangram puzzles. When the sheet is folded in sixteenths, it will fit nicely in the box. To fold in sixteenths, fold in half four times or fold top to bottom in fourths, then accordion-fold in fourths.